In 1826, the directors of the Delaware and Hudson Canal Company approached an old set of problems with new set of solutions. 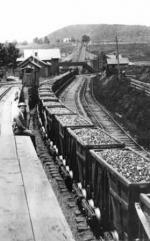 In order to transport hundreds of tons of anthracite coal from mines near Carbondale, Pennsylvania, they needed to move it over the steep Moosic Mountain and then across long level stretches to the head of its canal at Honesdale. To get across the mountains, they built five inclined planes with steam-powered winches to move coal up the west side of the mountain; and three more to perform the task on the east side. To move coal across the relatively flat, sixteen miles of ground between there and the canals that would barge the coal to towns along the Hudson River and to the great markets in New York City, the company settled on a system of rails and coal cars. Undecided, however, was the issue of how to push or pull those cars of coal to the canal barges. The company estimated that the cost of maintaining enough horses to do the job would be $71.87 each day, while a fleet of four steam locomotives - needing no rest or food, but much maintenance and wood for fuel - could do the same work for about $41.30 each day. But steam locomotion was a technology not yet available in America. And even the experimental engines then being built in Great Britain - the birthplace of railroading - were primitive and unproven. Convinced that the future of transportation lay in the steam-powered railroad - and willing to gamble that the technology would work as advertised - D&H Chief Engineer John B. Jervis in 1828 sent his young protégé, Horatio Allen, to England. Allen's mission was two-fold: to buy strap iron to surface the wooden track, and to consult with the best minds in Great Britain about their locomotives. Then only twenty-five, Allen bore a heavy responsibility, for he carried with him a letter of credit that enabled him to contract for whatever types and quantities of locomotives he deemed to be necessary. In Liverpool, England, Allen met with George Stephenson and his son Robert, then the reigning experts in the field. Together, they decided that steam locomotives were indeed practical. Allen then contracted with an iron works in Wolverhampton for 390 tons of strap iron rail, each rail to measure a half-inch thick and 2-1/2 inches wide, by 15-1/2 feet long. He then ordered locomotives both from Stephenson and from a firm named Foster, Rastrick and Company. Completed at a cost of $2,914.90, the Lion, built by Foster, Rastrick was shipped from Stourbridge to Liverpool, upon arrival was loaded onto a ship that arrived in New York on May 13, 1829. Set up for a stationary demonstration at a foundry in New York City, the "Stourbridge Lion" amazed observers, one of whom claimed that it looked like a giant four-wheeled grasshopper with the "fierce looking face of a lion." On August 5, 1829, the Lion was unloaded, set up, and placed on its track in Honesdale. "We shall put steam on her tomorrow or the next day," Chief Engineer Jervis wrote to D&H President Bolton, and then added that "anxiety raises as we approach the period when all our contrivances must come to their touchstone of experiment." The impression was very general that the iron monster would either break down the road or that it would leave the track at the curve and plunge into the creek. As I placed my hand on the throttle-handle I was undecided whether I would move slowly or with a fair degree of speed; But, believing that the road would prove safe, and preferring if we did go down, to go handsomely and without any evidence of timidity, I started with considerable velocity, passed the curve over the creek safely, and was soon out of hearing of the cheers of the large assemblage present. At the end of two or three miles I reversed the valves and returned without accident to the place of starting, having thus made the first railroad trip by locomotive on the Western Hemisphere. Allen's first trip may have been personally momentous, but the Stourbridge Lion was soon retired from use. Unwilling to pay for the strengthening of the track that would be necessary to hold the locomotive's weight, the D&H soon gave up on steam engines and laid planks between the rails for horses. Before the planks were completed, the railroad brought in teams of men to move empty cars on the levels between the planes. Jervis's records include vouchers for payments to laborers for "pushing" and "shoving" cars for their board. His bold experiment in the latest railroading technology had proven an expensive failure. The Lion remained in storage until its boiler was sold for use in stationary work. After his work for the D&H, Jervis went on to a successful engineering career with canals, several railroads, and the New York City water-supply system. Horatio Allen left the D&H shortly after the Lion trials to take a position as chief engineer with the South Carolina Canal and Rail Road Co.
For many years thereafter, the pioneering Stourbridge Lion was simply forgotten. But the idea of using steam-powered locomotives on rails was not. In the decades that followed, Mathias Baldwin of Philadelphia, Phineas Davis of York, and other Pennsylvanians would improve on the original English designs and manufacture some of the United States" most popular and well-known locomotives. Sometime after 1870, the Stourbridge Lion's boiler, cylinder, and walking beam were acquired by the Smithsonian Institution in Washington, D.C. In 1933, the Delaware and Hudson Railroad built an exact working copy of the Stourbridge Lion in its shops at Colonie, N.Y., and sent the engine to the Century of Progress Exhibition in Chicago. D&H exhibited the centennial replica at various celebrations and events, including the New York World's Fair in 1939-40, before placing it on permanent loan to the Wayne County Historical Society at Honesdale. Jim Shaughnessy, Delaware and Hudson (Berkeley, Calif.: Howell-North Books), 1967.